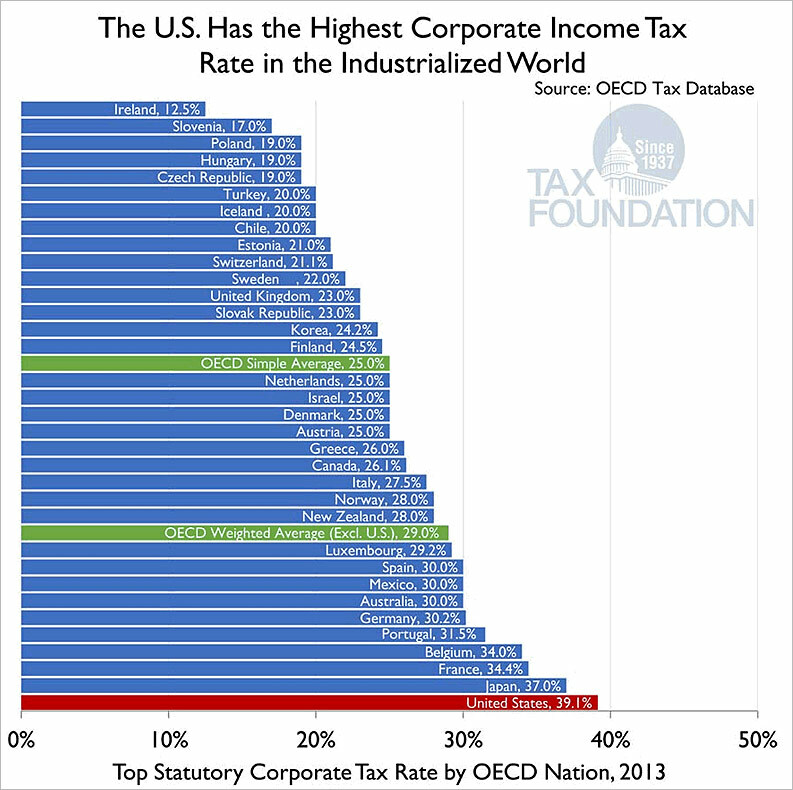 Does the U.S. Have the Highest Corporate Tax Rates in the World? Here's an interesting perspective on corporate tax rates. I'm sure you've all heard the argument that corporate tax rates are too high, and if only rates were lower, it would stimulate businesses, allowing for a whole array of positives. Proponents of this thesis will draw attention to the fact that the US has the highest corporate income tax rate in the industrialized world, currently at 39.1% (based on the 35% federal rate and the average rate levied by US states), see chart below. This high rate puts companies at a competitive disadvantage, they say. But there's more to the story. It turns out that yes, US corporations face a very high corporate tax rate; but many are extremely good at not paying it. 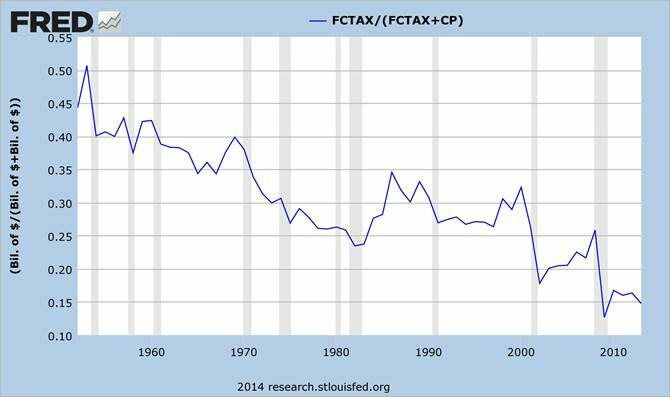 The chart below shows corporate taxes as a percentage of pretax profit. As you can see, the share of pretax profits that corporations are paying in taxes is near the lowest level in history. As a group, the 288 corporations examined paid an effective federal income tax rate of just 19.4 percent over the five-year period — far less than the statutory 35 percent tax rate. Twenty-six of the corporations, including Boeing, General Electric, Priceline.com and Verizon, paid no federal income tax at all over the five year period. A third of the corporations (93) paid an effective tax rate of less than ten percent over that period. Of those corporations in our sample with significant offshore profits, two thirds paid higher corporate tax rates to the foreign governments in the countries where they operate than they paid in the U.S. on their U.S. profits. I figured I should provide the list of the 26 companies that paid zero, or less than zero, in taxes during that time frame. After all, as one well-known financial educator once told me, it's not about how much companies make, it's about how much they keep. These companies generated so many excess tax breaks that they reported negative taxes and many received tax rebate checks from the US Treasury. 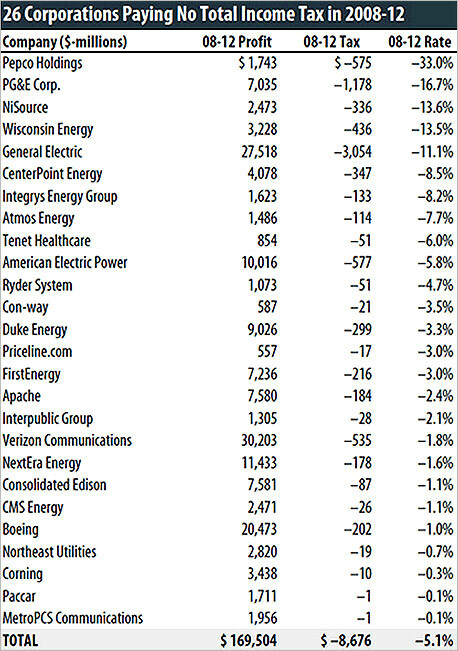 These companies' negative tax rates for that period means they made more after taxes than before. Go figure. You're probably wondering how some of these large US corporations are able to get away with such a low tax burden. Much of it has to do with the many tax loopholes and special breaks they enjoy, which are often unavailable to all but the most influential organizations -- those with the resources to employ lobbyists and throw money into the political arena. The tax breaks claimed by the companies in this study are highly concentrated in the hands of a select few. According to CTJ, "…25 companies claimed $174 billion in tax breaks over the five years between 2008 and 2012. That's almost half the $364 billion in tax subsidies claimed by all of the 288 companies in our sample." This study piggybacks on last year's Senate committee investigation into the tactics large technology firms use to avoid paying corporate income taxes in the US and elsewhere. The committee found that some extremely profitable domestic-based multinational firms are able to legally shift (on paper) their US profits to foreign tax havens where little or no actual business takes place. This is done through the use of artificial transactions in which US companies shift revenues to foreign subsidiaries located in low or no-tax jurisdictions. Most of the loopholes that these corporations exploit to eliminate their tax burdens are legal and the result of legislation passed over the years by both Congress and various Presidents. It would be natural to place blame on the "system" for providing an environment and incentive structure that allows certain industries and corporations to behave the way they do. But we must remember that the legislation allowing for these abuses was enacted largely in response to corporate lobbying and campaign support. Some tax breaks are actually company specific, such as the NASCAR depreciation tax break. Tax rates also vary widely by industry. Over the five year period studied, utility, gas and electric companies paid the lowest average tax rate at 2.9%, while healthcare paid the highest average tax rate at 29.6%. Much of this has to do with the uneven distribution of tax subsidies. In aggregate, corporate taxes covered over 25% of federal spending during the 1950s and 20% during the 1960's, but have since been continuously falling. In 2012 corporate taxes paid for only 7% of the federal government's expenses. Corporate tax avoidance may have benefits to shareholders, but it also comes with significant societal costs. The general public is perhaps the biggest loser under this system. As corporate tax payments fall as a share of government revenue, the general public must either pay more for basic services, receive less, or deal with a mounting debt burden to inevitably be placed on future generations. There is no way to get around the fact that declining revenues from corporate income taxes place additional burden on other taxpayers to make up the deficit. The US economy in general also suffers from this misappropriation of financial advantages. Many of us believe in the incredible power of free markets, yet what exists, in reality, is far from a free marketplace. In addition to the manipulation of the economy as a whole, government favoritism distorts private investment across and within industries. Investment and advancement, therefore, do not occur in line with the efficiencies that free markets encourage. Compounding the problem, companies are not forced to provide a straightforward statement of what they have paid in federal taxes on US profits. Information is available in aggregate, but companies often use cryptic disclosures in their annual reports. This makes the task of determining whether they are paying their fair share extremely difficult. Maybe it's not surprising, considering the negative publicity that would accompany true disclosure of tax liabilities. This would distort the public's opinion, and could possibly lead to efforts at reform. Good thing those advantaged companies have the ability to lobby for not only tax advantages, but also the right to not disclose the impact of those advantages (sarcasm intended). The above content was an excerpt of Richard Russell's Dow Theory Letters. To receive their daily updates and research, click here to subscribe.